The weather has been ugly and gray here in Jackson, Wyoming, so I had so time to check some of the photos I took last fall in at my home in Idaho. This fox adopted me last summer and would show up every afternoon or evening to see if he could entice me to share a sandwich or something. He would show up at my campfire and sit at the other side watching me. 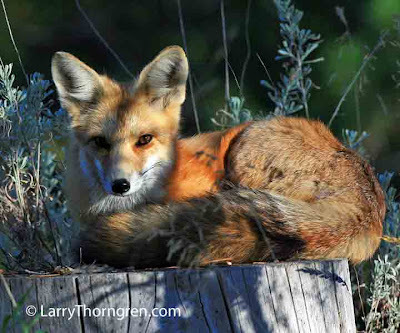 Foxes are very cat-like and can climb up or jump up on tree trunks and stumps. Great photo. Boom & Gary of the Vermilon River, Canada.